Philosopher Frank Seeburger's reflections on trauma as it relates to contemporary philosophical issues, especially those of truth, temporality, sovereignty, representation, politics, and the nature of philosophy itself. The only sorts of questions to which answers bring a close are no more than requests for information, of one form or another. When that information is given in answer to such a request, the question is closed. In contrast, the question that genuine authority poses to each of us is one we can never close. It must always be held open, awaiting further response. The question that genuine authority poses to us is one that can only be answered with the entirely of our lives. Vested authorities never like having their authority called into question, opened to being looked into and searched out. To have their claims to authority questioned threatens to make those claims and those who make them ridiculous, something not to be taken seriously. Something deserving of being mocked and ridiculed. Those who claim authority cannot stand the thought of such a thing happening to them. How does liberation come to a mind? A word spoken with an authority that neither has nor needs any authorization beyond itself delivers it. It is one thing to claim authority. It is something else altogether actually to have it. Those who truly have authority have no need to claim it. Nor do they have any need to seek out opportunities to assert it by exercising their authority over others. 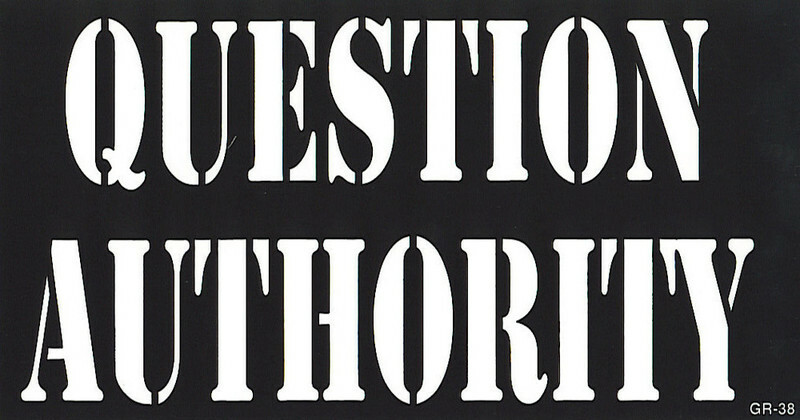 In The Question of Authority Tags Claims to authority, "The authorities"